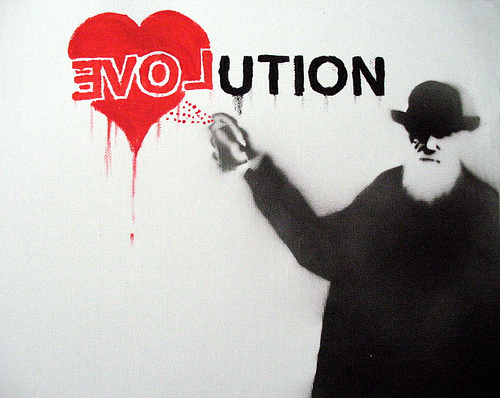 You are currently browsing the tag archive for the ‘Evolutionary Theory’ tag. Darwin by Peter Greenaway (1993) – Although British director Peter Greenaway is best known for feature films like The Cook, the Thief, His Wife and Her Lover, Prospero’s Books, and The Pillow Book, he has also completed several highly respected projects for television, including this 53-minute exploration (now free) of the life and work of Charles Darwin. 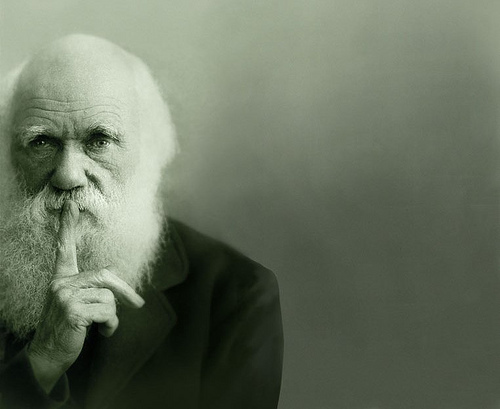 Darwin is structured around 18 separate tableaux, each focusing on another chapter in the naturalist’s life, and each consisting of just one long uninterrupted shot. Other than the narrator’s voice-over, there is no dialogue. Drawing (Pedigree of Man, 1879) – Ernst Haeckel‘s “tree of life”, Darwin‘s metaphorical description of the pattern of universal common descent made literal by his greatest popularizer in the German scientific world. 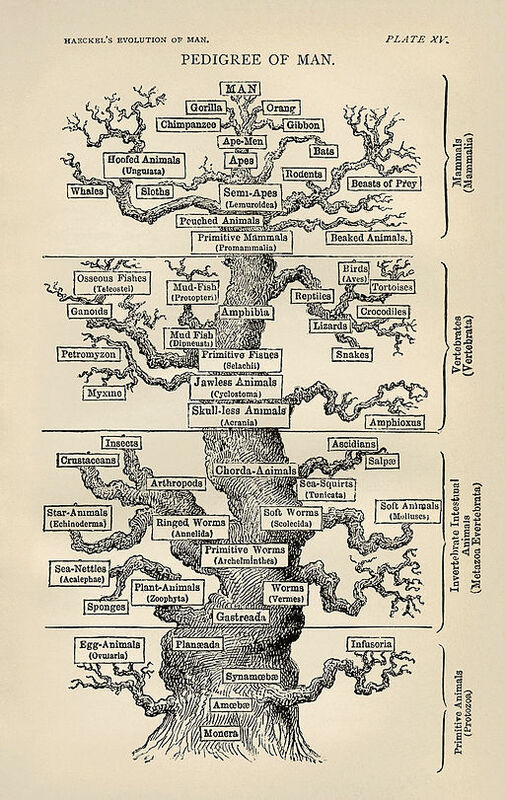 This is the English version of Ernst Haeckel‘s tree from the The Evolution of Man (published 1879), one of several depictions of a tree of life by Haeckel. 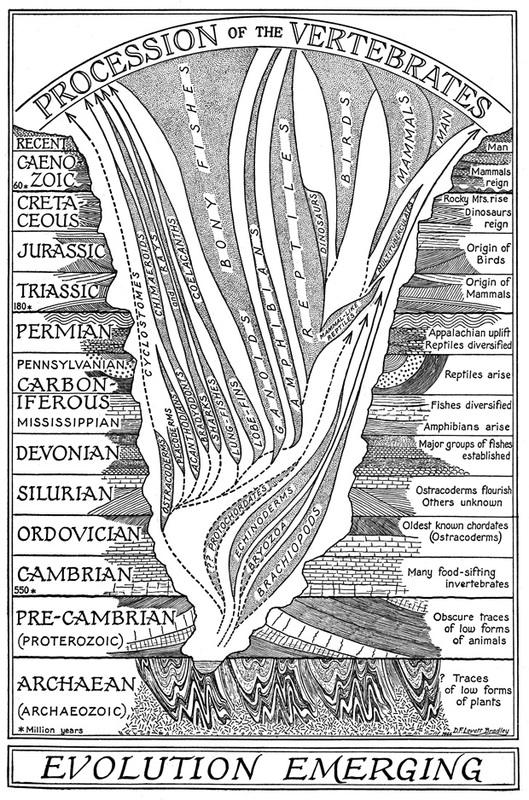 “Man” is at the crown of the tree; for Haeckel, as for many early evolutionists, humans were considered the pinnacle of evolution. No one really knows what a meme is, nevertheless when a good one comes around, everybody recognizes it…! (via Wikipedia – Meme Transmission) Life-forms can transmit information both vertically (from parent to child, via replication of genes) and horizontally (through viruses and other means). Memes can replicate vertically or horizontally within a single biological generation. They may also lie dormant for long periods of time. Memes spread by the behaviors that they generate in their hosts. Imitation counts as an important characteristic in the propagation of memes. Imitation often involves the copying of an observed behaviour of another individual, but memes may transmit from one individual to another through a copy recorded in an inanimate source, such as a book or a musical score. Researchers have observed memetic copying in just a few species on Earth, including hominids, dolphins and birds (which learn how to sing by imitating their parents or neighbors). 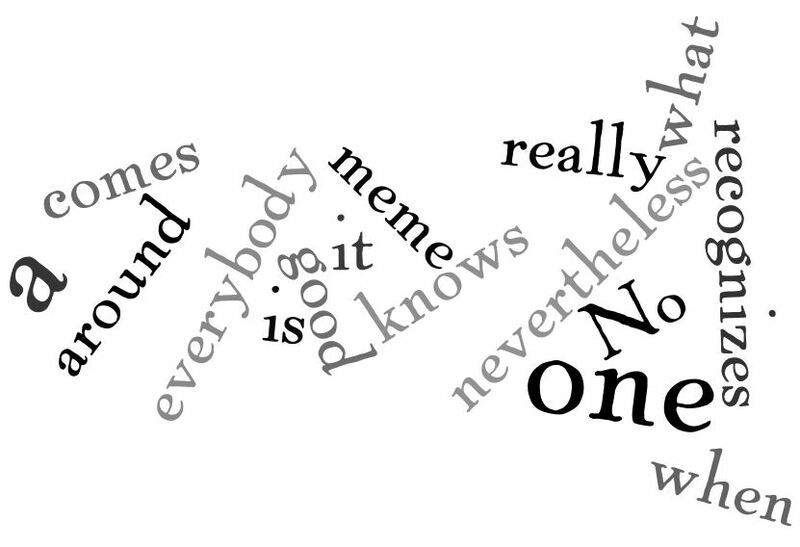 Some commentators have likened the transmission of memes to the spread of contagions. Social contagions such as fads, hysterias and copycat suicides exemplify memes seen as the contagious imitation of ideas. Observers distinguish the contagious imitation of memes from instinctively contagious phenomena such as yawning and laughing, which they consider innate (rather than socially learned) behaviors. Quantity of parenthood: an idea which influences the number of children one has. Children respond particularly receptively to the ideas of their parents, and thus ideas which directly or indirectly encourage a higher birthrate will replicate themselves at a higher rate than those that discourage higher birthrates. Efficiency of parenthood: an idea which increases the proportion of children who will adopt ideas of their parents. Cultural separatism exemplifies one practice in which one can expect a higher rate of meme-replication — because the meme for separation creates a barrier from exposure to competing ideas. Preservational: ideas which influence those that hold them to continue to hold them for a long time. Ideas which encourage longevity in their hosts, or leave their hosts particularly resistant to abandoning or replacing these ideas, enhance the preservability of memes and afford protection from the competition or proselytism of other memes. Adversative: ideas which influence those that hold them to attack or sabotage competing ideas and/or those that hold them. Adversative replication can give an advantage in meme transmission when the meme itself encourages aggression against other memes. In their book Made to Stick, Chip and Dan Heath describe characteristics of an idea that make it “sticky” (i.e. memorable or interesting). Note: I personally recommend Cosma Shalizi “Memes” web entry. Center for the Study of Complex Systems, University of Michigan (26 September 1997).